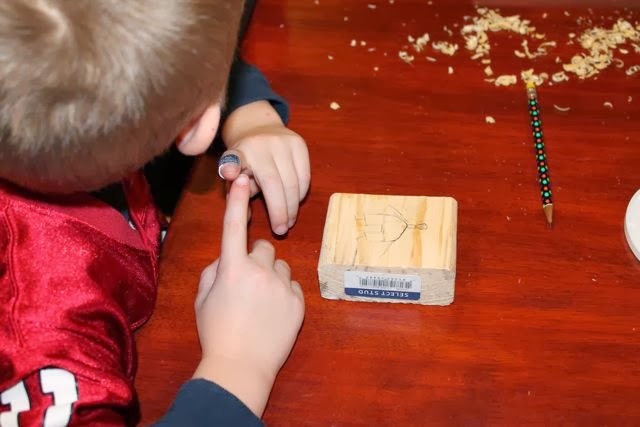 This time of year is very exciting for our family; My wife and children are home for the holiday break, we are enjoying numerous visits and parties with extended family and friends, the kids have received many new toys as gifts (lots of Legos! ), and my wife Lisa and I will celebrate our anniversary right before the New Year (and this year we have scheduled a date to go out to lunch together -- alone!). I have said this many times before, but for all of my new readers you need to know that my wife reads every one of my blog posts before you do. I don't have the confidence to post anything without her approval. Even after writing this blog for four years I still need her help. 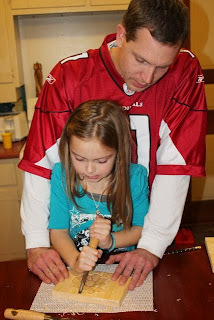 Her patience and support have encouraged me to continue to write this blog when I have become overwhelmed and frustrated. This week I was reading Erin E. Stead's 2011 Caldecott acceptance speech and she said, "It is a tremendous gift to have people in your life that know better than you." Lisa knows I need to write this blog. 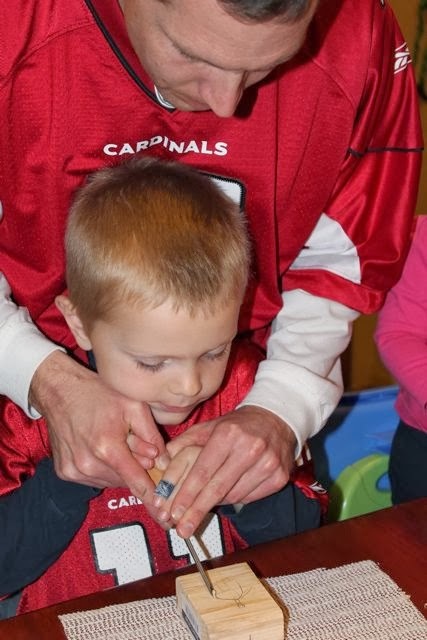 She knows that I am happiest when I am reading books to my children before bed and when I have just completed a fun activity with them that brought a picture book to life. It is pretty obvious -- my dancing and fist pumping usually give it away -- that I also feel pretty good about completing a birthday blog post featuring one of my new favorite authors or illustrators. But, (she hates it when I start a sentence with "but") I know it has got to stink for her to hear me say at 11:00pm, "Can you proofread my post?" Never once has she complained. Thank you Lisa, for an amazing 11 years together and for instilling confidence in me when I need it most. Happy Anniversary! I am looking forward to many more. Erin E. Stead is the illustrator of four picture books including the 2011 Caldecott Medal Winner, A Sick Day for Amos McGee written by her husband Philip C. Stead. 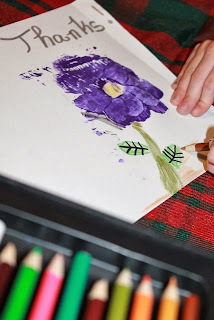 I learned while reading Erin E. Stead by Philip C. Stead, an article in The Horn Book Magazine, that Erin lost all confidence in her art and stopped drawing for three years. Then, Philip wrote a story with Erin's strengths as an artist in his mind. He approached his editor, without her knowledge to show him his wife's only recent drawing. His editor loved her drawing and the story Philip wrote about a zookeeper, his friends, and a day away from the zoo helped his wife regain her confidence in her art and blossom into an admired children's book illustrator. Recently, Erin has illustrated two books by Julie Fogliano, And Then It's Spring and If You Want to See a Whale. Her latest book Bear Has a Story to Tell was written by Philip C. Stead. 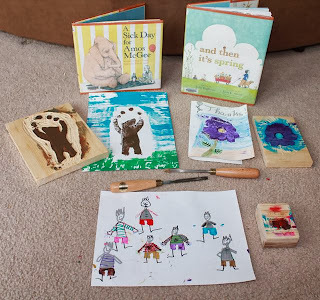 I love children's book illustrations that are created with woodblock printing. I love the grainy nature of the images and the slight imperfections. I always wondered about the artistic process that produced these beautiful images. 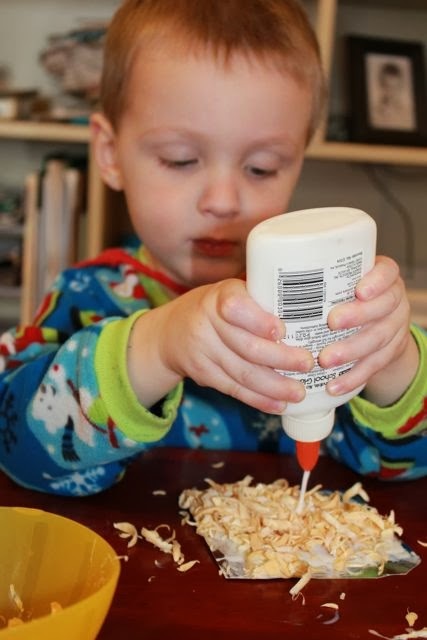 During my initial research for this birthday blog post I discovered a YouTube video where Erin E. Stead shares the process she used for A Sick Day for Amos McGee. She states in the video, "All of the color you see in the book [Amos McGee] is stamped on the page by a piece of wood that I carved the animals shape into. 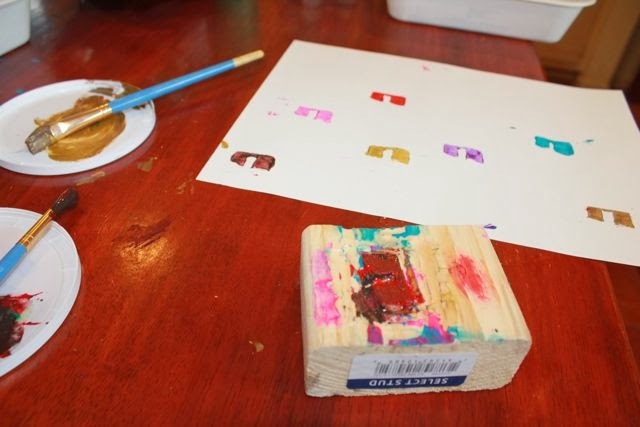 Then after the block is carved I spread color onto the block and press paper onto it. 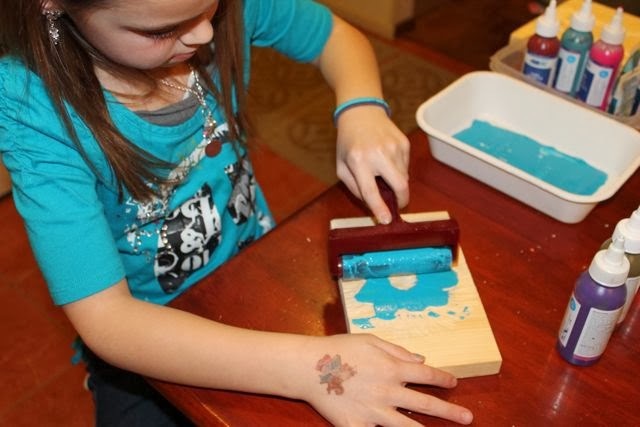 Almost the way you would use an ink pad and a rubber stamp." (MacMillan Children's on YouTube, video below). 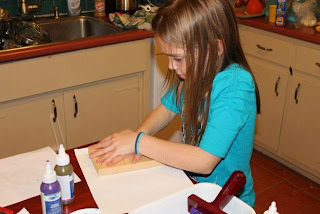 This video was the inspiration I needed to try woodblock printing with my family. 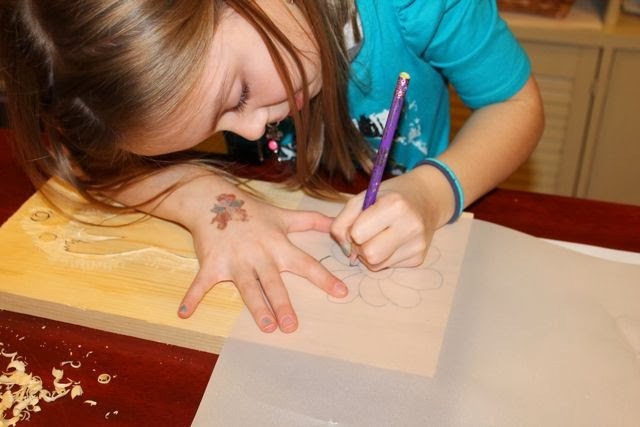 My daughter sketched a flower on a white piece of paper to begin. My son drew right on the woodblock. My daughter then traced her drawing onto transparent paper. 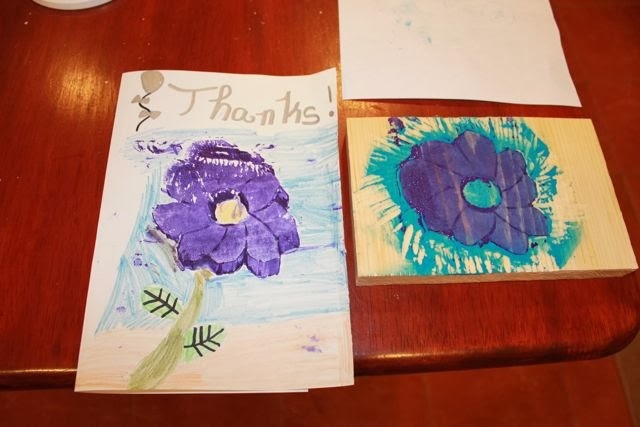 Then, she flipped it over and heavily traced the image to make an impression of her flower in the wood. I was nervous (so was my wife, who I call the "safety patrol") about giving my son a chisel so we decided that I would guide him hand over hand. We also simplified his drawing and decided that we would carve out everything but the pants from his person (more on that later!). My daughter traced the impression she made in the wood with her pencil. Then, I carved around the edge of the image. We need to thank Grandpa Z. for allowing us to use his woodcarving tools. 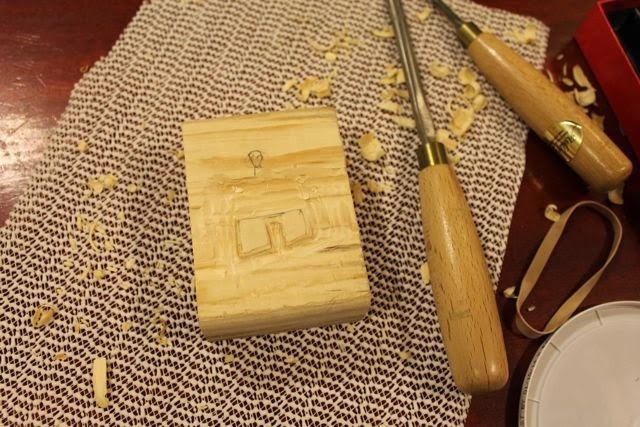 He inherited them from his father, who used them to carve the wood drawings he created. My son would not have been able to make his woodblock carving of the pants with them. The reason we decided to carve just the pants is because he recently started drawing really cool pants on all his people when he doodles. 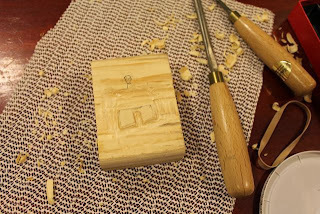 I have remarked how much I like them, so we decided to immortalize them in a woodblock. 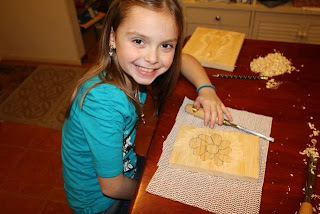 The carving that I did around the edge of my daughter's flower allowed her to use a larger chisel. She worked outward from the line I carved. She was quite pleased with how quickly she was able to carve her image in the woodblock. She was ready to make her print as soon as the woodblock was carved. 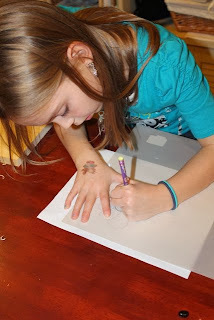 We used water-based ink. 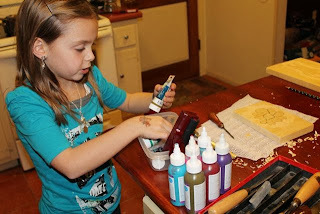 Erin E. Stead said on the Seven Impossible Things blog, "I use oil ink, because it has a rubber stampy texture and picks up the wood grain nicely." 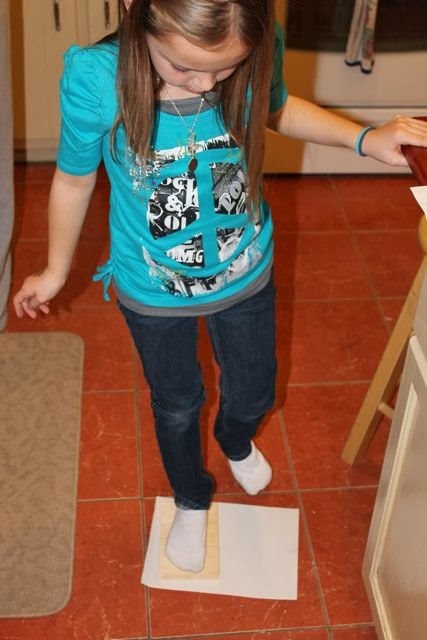 We still had our brayer from a project back in December 2010! 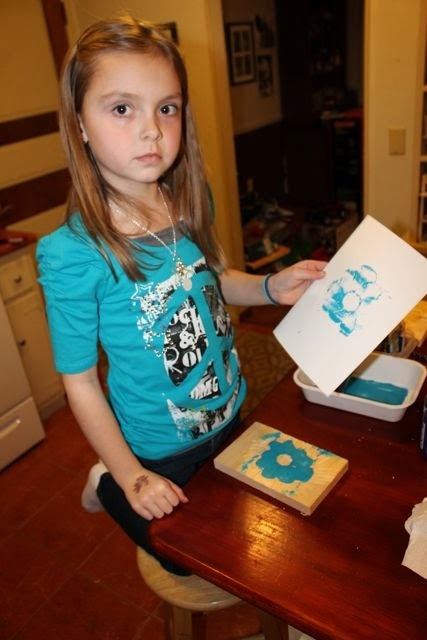 She wasn't happy with her first print! 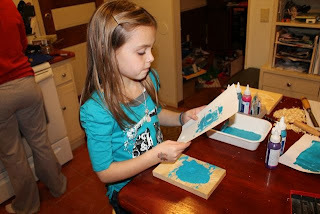 Her second print was better, but it was still not what she was looking for. She changed to purple ink and tried again. 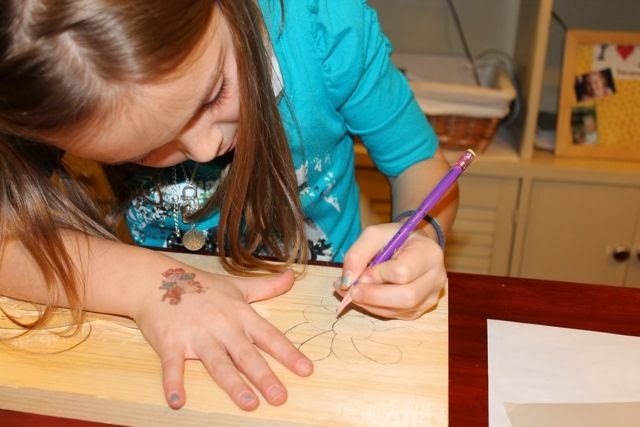 Before she lifted the paper off the woodblock she decided to try a new technique. 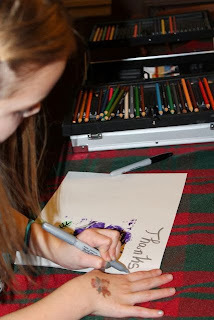 She was happy with her print and began turning the image into a thank you note for a friend. She used colored pencil and Sharpies to finish her drawing. Erin E. Stead drew on top of her woodblock prints with pencil for Amos McGee and And Then It's Spring. WOW! I thought this turned out fantastic! 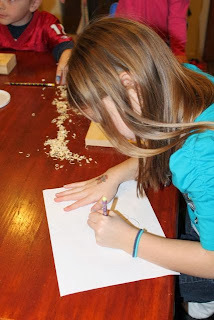 We wondered which is the work of art -- the print or the woodblock carving. We decided that it was both! The next day my son was ready to try his hand at printing. 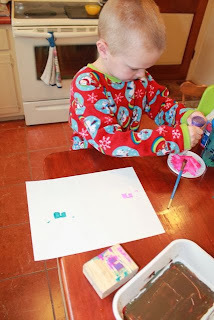 He decided to make prints of the pants in many different colors all over a piece of paper. Once these pants dried he was going to draw people wearing the pants. Meanwhile, my little ones made bird's nest ornaments using glue and the wood shavings from our woodblock carvings. This was my wife's idea. I thought it was brilliant and it gave them a chance to join our birthday celebration for Erin Stead. 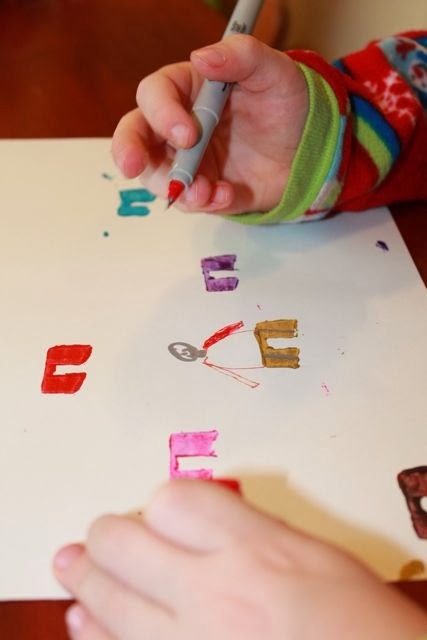 My son used fine and regular-tipped Sharpies to draw his people. I highly recommend reading all of Erin E. Stead's books and trying out woodblock printing. We had a great time! Join Amazon Prime - Watch Over 40,000 Movies - 30 Day Free Trial!